Working at a winery that makes sparkling wine is one of the best parts of my job, it is also one of the most challenging. In the wine shop, on a daily basis I hear our visitors remark that our sparkling would be great for New Year’s or their anniversary…and it would be. But the message I feel I am always trying to share is that sparkling, or champagne or prosecco or any other bubbly is a wine. Despite the fact that it contains 49 million bubbles it deserves to be treated like any other wine. You wouldn’t think twice about opening a white or a red wine any day of the week. So why not open a bottle of sparkling on a Thursday, because it’s almost the weekend or your power bill arrived and it was either higher, or better yet lower than you expected. Sparkling is not just for special occasions it is for everyday and we all need to drink more bubble for no reason. Everyone says they have a bottle that they are saving for a special occasion. My advice is don’t wait for that special occasion, they don’t always happen like you expect. Instead open the bottle of sparkling and make the occasion special. You can always replace the bottle with another for that far off special day. At our house every gathering starts with bubble, usually sparkling or prosecco. We find it gets everyone into a celebratory mode regardless of the occasion. Sometimes I wonder if people get hung up on not having the right glassware. Not everyone has a bunch of champagne flutes in their china cabinet nor does everyone want the hassle of washing them every time. Enjoy your sparkling in a regular wine glass. You will be amazed at how much more of the aromatics of the wine come through and it will take away the stuffy feeling of having to enjoy it in a flute. 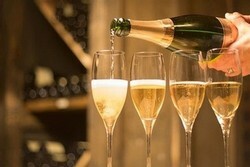 Don’t get me wrong flutes lend something to the celebration but they are not a must have to enjoy sparkling. This year make a New Year’s Resolution when you are toasting with friends or family with your celebratory glass of sparkling in hand to drink more bubbly for no reason. I guarantee it will be the easiest resolution you have ever tried to keep. And remember life is a celebration!